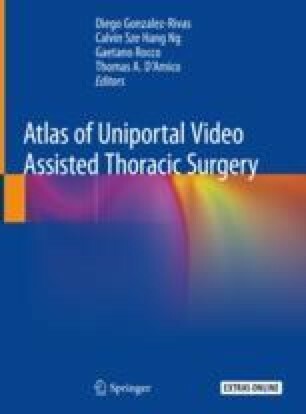 The uniportal approach to video-assisted thoracoscopic surgery (VATS) sleeve resection may be considered for patients undergoing conventional VATS sleeve resection. In this chapter, we describe the technical details of the uniportal VATS approach for bronchial sleeve resection. Further study is needed to address the long-term outcomes and the ability of thoracic surgeons to carry out these crowded surgical techniques. The online version of this chapter ( https://doi.org/10.1007/978-981-13-2604-2_30) contains supplementary material, which is available to authorized users.